Big Boards & twixt-commentator help? Alan is aware of the issue, but of course he is under no obligation to update his analysis site. He originally developed the site as a way to do post mortem analysis. But then Richard put a link to Alan’s site on every active game. So, Alan might not allow any analysis of large grid games in progress, instead allowing analysis only after a game is over. Or he might not do anything at all. Install Jtwixt on your machine. In the file menu, select “new board of size” and choose 30. If the game you want to analyze involved swap, Then in the Board menu select flip board and then in the same menu select flip grid labels. This will result in a display which matches the LG display, although the piece colors will be the opposite of what they were before you flipped, and the swap move will not be included in the move list. Manually input the moves for your game. If a downloadable file becomes available, that would mean you wouldn’t have to input moves by hand, nor would you have to flip the board. But even without that inconvenience, it would of course be easier to use a site such as Alan’s. For 48x48 games, for the time being maybe you could use some graphics editor to create your own board image to manipulate the position with. My comment was not a critique of Alan and the nice twixt-commentator.dyndns.org site we all use. It was meant to inform the twixt community that they cannot look for help on the twixt-commentator.dyndns.org as it does not apply to the bigger board style games that have been recently introduced to littlegolem. 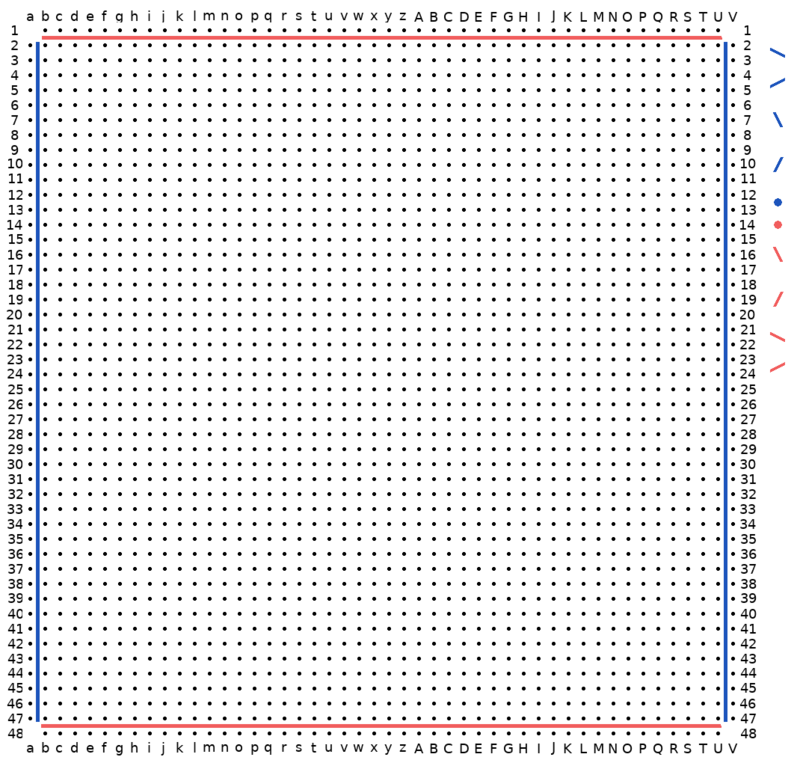 You can download here an image of a 48x48 grid. With an image editor such as GIMP, define a grid as 5 pixels in each direction with no offset. Use rectangle select to copy the off board pegs and links (on the right side.) make sure snap to grid is in effect. You don’t have to show the grid. It’s awkward but it’s the best I can do for now for 48x48. For 30x30, see the Jtwixt instructions above.